If you are looking to get a great-looking and fun gift for your furry buddy, the internet is a great place to start since you can find a plethora of excellent choices that range from quality cat hoodies to furniture or different toys. Whether you know what to look for or not, we have compiled a list with some of the products we’ve found interesting. The list that you can find below contains only products that have garnered great customer feedback and that stood out thanks to their quality and affordability. The Tower of Tracks is built to stimulate the senses of your cats and excite their minds as they work to bat every ball and enjoy the fun. The unique design will ensure that the balls will spin securely across the tracks for hours with little chance of them getting out or your furry companion getting hurt. All the three balls are brightly colored to catch the eye of your feline friend. 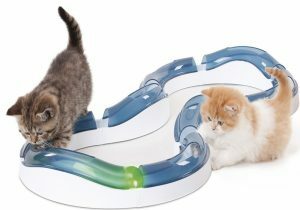 The track is built with non-slip base pads and a closed top that will allow you to join in on the fun and play together with your cat. 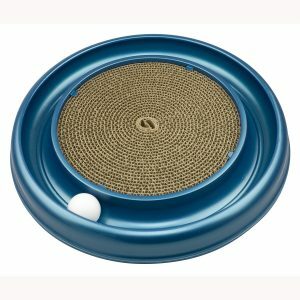 The Bergan option combines a quality cat scratcher with a channel that houses a small ball your cat can shove with his paw or nudge with the nose for hours of fun for your furry pal. The scratch pad has the perfect texture to stimulate your cat’s desire to scratch and sharpen his or her claws and prevent your precious furniture from becoming the go-to scratcher. The middle textured scratch pad is durable but also replaceable meaning that if you have a pet that likes to scratch a lot, you will be able to save on money and only replace the center pad, not the entire toy. The Cat Cube is designed to fulfill your cat’s instinct to play and lounge by offering a comprehensive and portable solution that is easy to assemble, and that collapses flat when not in use or when you are traveling together with your furry companion. It features a sturdy construction that is ready to handle even the most active pets that like to jump and run a lot. The hideout includes a plush hanging ball with “hide&seek” cut-out that will promote play, as well as keep your cat relaxed by having a place where he/she can sleep without being disturbed. 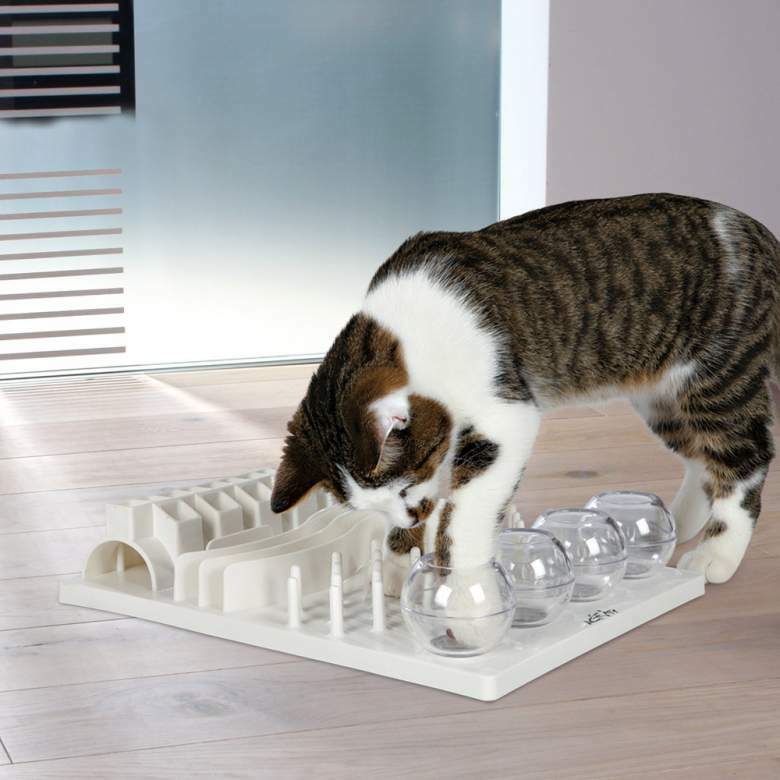 The Roller Circuit will quickly get the attention of your cats thanks to the high and low sections and the enticing motion-activated ball that zips around inside the circuit at high speeds. The ball is also illuminated, and that will entice the cats to swipe and chase at it since the circuit allows for curious felines to touch the ball safely. 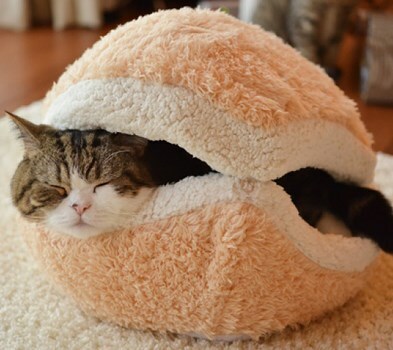 Customers have found that cats are drawn to this toy not only to play but also to sleep in it. What’s more, the unit is very durable and even after years of use when the lights in the balls burn out, you can replace them with new ones thanks to the customer-friendly design. 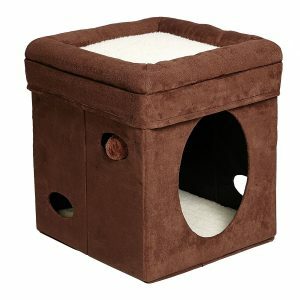 The Kitty City furniture features a modular design that is very easy to assemble and clean. Since it is modular, it means that you can personalize the look and configuration of the unit to fit any space. The furniture is very light and easy to move around but still sturdy enough to handle the weight and energy of playful cats. 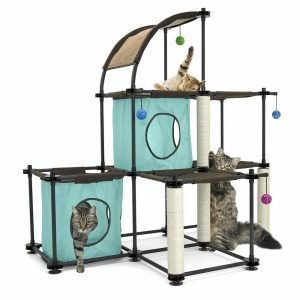 Apart from the climbing platform and the sleeping areas, this unit also features four different scratch posts to satisfy your cat’s scratching urges and keep the claws healthy. There are also numerous multi-colored jingle ball toys that will prevent your feline companions from getting bored. The Trixie option is a hammock that features two scratching posts with a bed at the top that is wrapped in a soft longhaired plush fabric that your cat will absolutely love to sleep in. There is also a toy ball on a string that is covered in the same plush fabric which in this case mimics the look of a mouse. The base of the tree is also very fluffy meaning that if you have two cats, one can sleep in the hammock while the other can use the base, which is just as comfortable and warm. With three different water flow settings, the Catit Fountain can satisfy even the pickiest drinkers and offers maximum oxygenation for fresh and great-tasting water. The 3L (about 3 quarts) re-circulation system is packed in a very compact body, which means that it will take very little floor space, certainly not more than the classic water bowl. 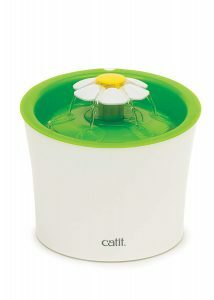 The unique design will make it so that your cat has access to fresh water even when you are not there to offer it. The model includes a dual-action water softening filter, and a small and energy-efficient pump that powers the fountain. To remain entirely safe, the unit uses only BPA-free materials. 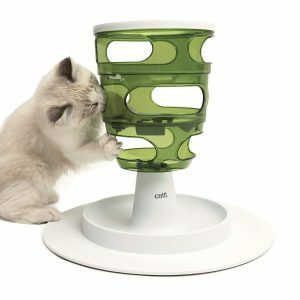 If you live in an apartment and you want to let your feline experience a bit of the thrill of having to work for his/her food, this new and improved toy from Catit will do just that. The smart toy stimulates cats and forces them to work in order to get to their food, a challenge that pets will find thrilling and fun. The toy is made from BPA-free materials and is very easy to disassemble and clean. 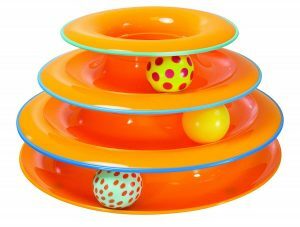 It comes with three difficulty levels so that you can adjust to the needs of your cats and ensure that the toy never becomes frustrating or too dull. There is nothing that can stimulate cats more than their natural prey: mice and rats. This cute toy has the realistic shape and size of a rat, and that will trigger an instinctive response in your feline friend. 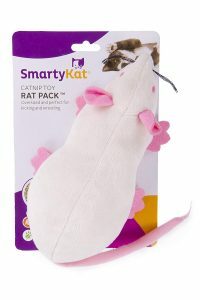 Just as they would do with a real rat, your cats will love to play and throw this nifty toy around. To ensure that your cat will instantly be attracted to the toy, there is also some catnip wrapped up in the stuffing. Buyers have also reported the product is quite durable, meaning that it can handle the claws of even the fiercest cats. Have you ever noticed that cats like to eat grass? That is because grass can act as a digestive aid, and grass provides a renewable resource of enjoyment and fiber that will help prevent the formation of hairballs. The Organic Pet Grass Kit contains a blend of wheat, rye, oats, barley, and flax. Growing the grass is also very easy and only takes about 5 to 7 days before your cat can go and taste it. 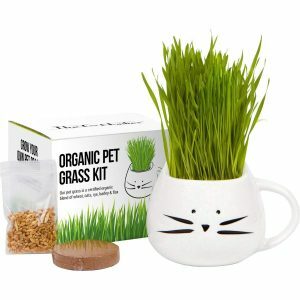 In the kit, you will find one cute cat grass planter, organic seed mix, organic planting soil medium, and a set of instructions that are very simple and easy to follow. With the Christmas season always fast approaching, now is a good time to get one of the best cat gifts for your pet or for any feline-loving friends you might have. Unless you enjoy thinking of presents at the last moment, when all shops are so full that you can barely squeeze another unfortunate parent or pet owner in, you should definitely consider purchasing some quality products now. If you have a cat, then the choice is simple: just get one of those simple ball sets, and you’re set for another year. However, your cat might not enjoy receiving the same old present every Christmas, so this year you might have to think a bit harder and come up with something unique. There are actually numerous ways to make a cat happy, from getting toys, treats or a huge cat tree complex, to going for a healthy and balanced diet, a thing which you may have been postponing for a while. If you have cat-loving friends, then your problems won’t stop here. You will need to think of something to please these feline fans, and there are few items that come to mind, such as a cat-themed shirt, a pair of cat glasses, or even a big and funny cat costume. Although some cat presents can get high scores for their sheer coolness, these surely need to serve some function, at least for entertainment purposes, to be included on the best gifts for a cat list. Useful items include toys, cat appliances, and structures, cat treats and food, etc. Depending on the most urgent needs of your cat, you could either go for a change in diet or a kitty exercising complex to help your cat lose those extra pounds. Toys never seem to be enough when you own a cat, but the good thing is that there are still millions upon millions of products on the market that you can buy for a few bucks to help keep your pet entertained. You will most likely need to buy some presents for your friends and work colleagues as well. If guessing the right present for a friend is usually the most difficult part, you can surely know which awesome gifts for cat lovers you need to get this year and be confident that you will make the right choice. You don’t need a special occasion to give your cat a cool gift, but you certainly don’t want to be caught empty-handed this Christmas. One of the best possible presents you could give your cat is a huge cat tree. If you have enough free space in a large room and enough cash on the credit card, then one of the extensive cat condos, with many interconnected bridges, platforms, and cat houses/beds is a perfect choice. 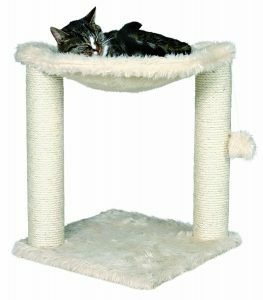 There are many inexpensive options as well, and a regular cat won’t object to a conventional scratch post with one or two platforms and a tiny bed perched on top. Toys play an important part of a feline’s life, so you don’t want to miss grabbing one or two for your kitty. There are lots of toys available on the market ranging from the simple and obvious to the downright crazy or unusual, so you’re guaranteed to find something that your cat will enjoy. Usual cat items include automatic mice that your cat will joyfully chase around the house, wands, strings, balls, and even complex board games or railway sets which come with numerous moving parts, so your cat will probably have a lot of exploring to do in the following weeks. One of the best cat Christmas gifts you could possibly offer your fluffy pet would actually be a better diet. Unless you are already feeding your cat with the highest quality food available, you might want to look for some cat foods made by reliable brands that could help keep your beloved kitty healthy and safe. You get to choose from an immense variety of foods, from variants which contain deboned chicken and potatoes to entirely vegetarian diets. You should make sure that you choose balanced foods which contain a good amount of proteins, carbohydrates, and healthy fats, as well as dietary supplements such as vitamins and minerals. With a proper diet, your cat will develop strong bones and muscles, have more energy for all sorts of funny flicks and running, as well as spread the good mood around the house and help everyone feel a bit better. If you’re trying to figure out what the best cat lover gifts are, then a cat shirt should surely be on top of the list. With a feline-themed shirt, any cat enthusiast will feel flattered and proud, and the best part is that you can also ensure that the shirt itself is of high-quality so that it can keep your beloved friend or family member warm and cozy. You can purchase a soft and comfortable shirt that has great insulating properties and an attractive design that can depict cats in all sorts of characters and positions. Some of them can contain witty quotes, while others are so funny that they’ll probably be able to put a smile even on a grumpy person’s face. When it comes to cool cat themed gifts, glasses and sunglasses are a fine choice. You can choose vintage eyeglasses similar to what Hollywood celebrities wore in the 60s, or a pair of cat eye sunglasses which are ideal for a child, offering protection against UV rays as well as a fun accessory to brag about at school. A cat costume is also a good gift for a feline-loving person, especially if that person is a child. Kids love to dress as all sorts of animals, so this suit will be perfect for just about any junior. Adults have the right to feel good too, so you can even think of getting an adult-sized cat costume. Just make sure that the recipient will wear it, otherwise, you could be forced to trick-or-treat as a cat next Halloween.